Students for best study & Education wish to get admission in Central Hindu School in class VIth/ IXth or XIth. CHS is run by Banaras Hindu University: BHU. In Central Hindu Boys and Girls School students can avail admission through the School Entrance Test SET. If you are such candidate & willing to know about the BHU SET 2018, Central Hindu School Admission Process, Here is the completed details for it and easy link to explore more information. BHU CHS every year give admission in CHBS & CHGS in class 6th/9th and 11th through the School Entrance Test SET. Students who qualify SET with a minimum of 33% marks and full filling the term and condition of BHU CHS then they can enrol/admission in School. Below stepwise details and link about the all completed process about the Admission in Banaras Central Hindu Boys and Central Hindu Girls School class wise and course wise information with the link given to explore the information before having an admission. Before aspirants apply online application form must be aware of SET eligibility for admission for which course they wish to get. Central Hindu School for Girls and Boys have made some of the criteria for admission class wise and course wise. Aspirants must be aware of the Banaras Hindu University – Central Hindu College/School Class 6th, 9th and 11th class admission Eligibility know completed details here. For applying for any application form online aspirants have to follow the step. For easy to know every step to online apply BHU CHS SET 2018 Application form, On this website, stepwise process, has been given with the screen short of filling Banaras CHS School Entrance Test Online Application Form at www.bhuonline.in. Know Central Hindu School Banaras SET Online Application Form Filling process Here. Here all important dates about the School Entrance Test 2018 for admission in Central Hindu Boys/Girls School Banaras in class 6/9/11 about the applying, admit card download, exam dates and result announcement date with counselling dates particulate events wise find below. Every examination question has been asked on basis of the pattern. To participate in examination and cracking of Examination students must be aware of the Examination Pattern for which exam they are going to participate. To easy to explore the information about the BHU SET Examination Pattern know here Exam pattern of BHU CHS School Entrance Test 2018 for entrance Test to admission in 9th/6th or XIth Class course wise. In every examination question paper come from the particular syllabus to judge out the aspirants about their basic and knowledge on that concern test. Similarly Banaras Hindu School for Boys and Girls School Entrance Test examination syllabus class wise help students to prepare for admission entrance examination. To every concept of BHU CHS SET Syllabus of Class 6th/9th/11th Entrance Examination. Admit Card is one of the documents which help students to know about the completed details about the examination like date of examination, Exam venue, Exam Time as well date with information about BHU SET CHS Exam 2018. For participating in School Entrance Test Admit Card will be mailed to the student’s email id which has been provided registration time. Know all aspect of BHU SET Admit Card here. After the examination Answer key of BHU SET will help aspirants to judge out their performance level in the examination. Before the announcement of BHU CHS SET Result Answer key will help students to get an overall idea about coming marks in the entrance test. Know about Central Hindu School SET Entrance Test Answer key 2018. After the examination students become excited to check out their result and know about the next process to get enrollment in School. For checking out the Result of BHU CHS School Entrance Test 2018 aspirants have to follow some step which has been given here. The result of CHS SET 2018 can be checked out using roll number and Date of Birth hence students are suggested to keep safe the BHU CHS Admit Card of SET 2018 for next admission process. 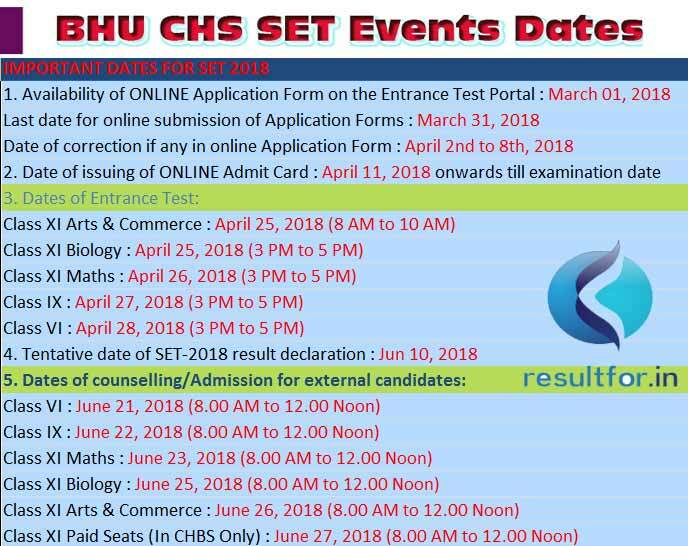 In the Counselling process first of all aspirants/candidate need to check out the result and CHS SET 2018 Merit list which published by the BHU at www.bhuonline.in for call students for doing next process of admission. A personal letter for counselling in BHU SET for Admission in CHS for Boys or Girls in Class 6th/9th/11th will be sent, Know all the counselling process of Banaras Hindu College running Central Hindu School admission. In Central Hindu Boys School and Central Hindu Girls School number of seat class wise and course wise allotted in various quota and category to admission to a school. To know all number of Seat for General, Staff and for various other categories like a government employee, permanent BHU Employee, SC/ST and Divayang/PWD categories know extract information about seat allotment through various categories prefer official information bulletin here. Please note > Information credit various website and official website of BHU. We on this website provided the details for purpose of easy access to information about admission. This is not an official website of any education department or institute. Visitors can visit the official website for any such information.